Halifax winger Gareth Potts sees Sunday’s Championship fixture against Sheffield at the Keepmoat Stadium (4.15) as a pivotal one in the race for a top four finish. Fax go into the game in fourth, but are four points shy of the third-placed Eagles with rivals Featherstone, London and Dewsbury only behind on points difference. And having come up short against London, Leigh, Bradford and Rovers so far this year, Potts is well aware that Richard Marshall’s side need to start picking up results against the teams around them sooner rather than later. 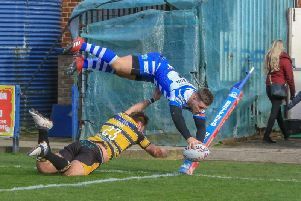 “It’s a massive game, because we need to start picking off those teams that are above us and around us,” said Potts, who was on the scoresheet at Belle Vue last Friday as Fax went down 44-16 to Wakefield in the Challenge Cup. “If we can do that, we can start to cement our place in that top four and make sure we are back at places like Wakefield later in the season playing in the Super Eights. “That’s what we are aiming for. Potts’ try against the Wildcats was a sweet moment for the speedster, who began his career with the club before arriving at the Shay via a two-season stint at Batley. “It’s always nice to get on the scoresheet, especially there,” he said. “I was here about six years; through the Academy, a couple of years in the 18s, a couple of years in the reserves then I had a full time year when I went on loan at Doncaster. “It’s my hometown club and I learnt my trade there, so it was nice to go back. “The last 10 or 15 minutes we got a bit sloppy and I don’t think the scoreline didn’t really reflect the game. “We were in it for a long time, and even with 20 minutes to go and six points down we felt we could win it. “It doesn’t really matter if they’re bottom of their league, it’s a step up in class. “They’re full time athletes and most of our side had been at work before going out to put a shift in on the field.